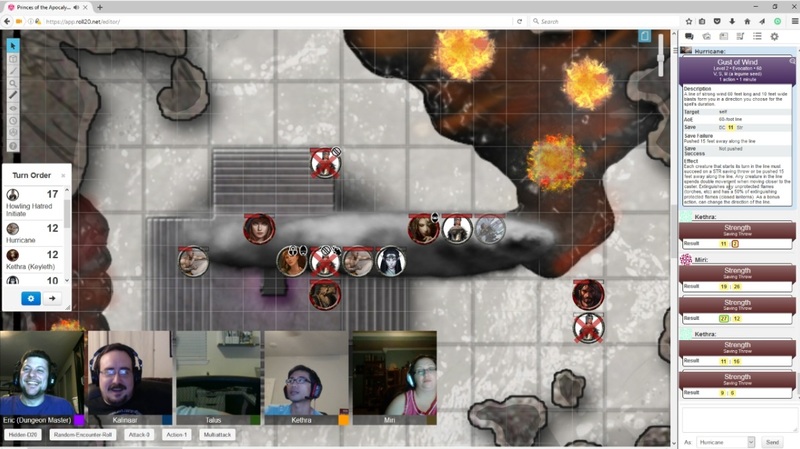 In this week’s session the party got back on track in the Fane of the Eye, making their way toward the altar and the Queen of Air. But first, a little detour with a cursed statue. Previously our heroes had explored most of the Southern half of the Fane of the Eye. They’d journeyed from the Air Temple to the Water Temple purely by accident, and actually defeated Gar in the water temple before ever setting foot in the air pyramid. This allowed me to adjust Aerisi’s location, and switch out her captive for one that has far more meaning to my players. Inky veils separate many of the ‘rooms’ of the Fane of the Eye. The campaign book describes the nauseous, psychic assault when passing through. Given the PCs incredible power level, I added a straight-up CON save and small amount of damage every time they pass through. Journeying through the Fane is a literal drain on their resources. 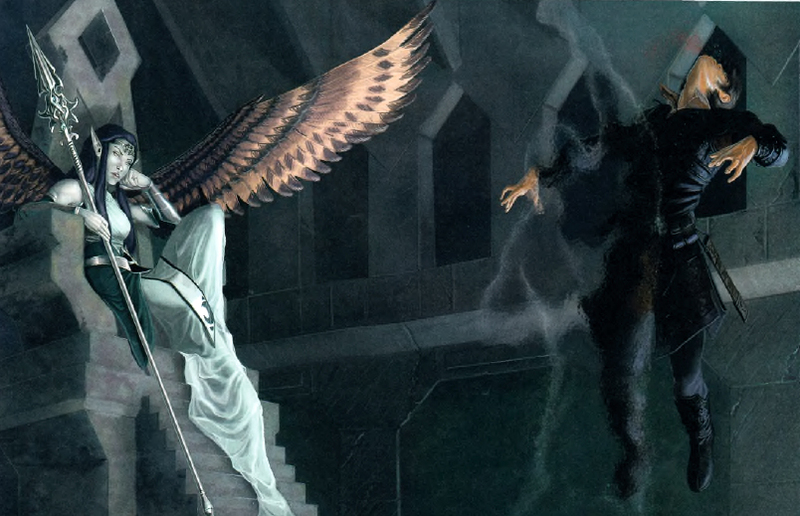 They entered F20 of the Fane, home to a guardian Air Elemental Myrmidon. Poor armored elemental. It suffered a similar fate to every creature that’s by itself in a room – complete decimation by the PCs. Pretty sure the inky curtains did more damage than his three-attack per round flail. With the elemental guard crushed, they continued North to F19. The large room has four exists and depicts a statue with a purple crystal eye. This sets off all kinds of warning alarms to my players, and it was delicious watching them squirm. 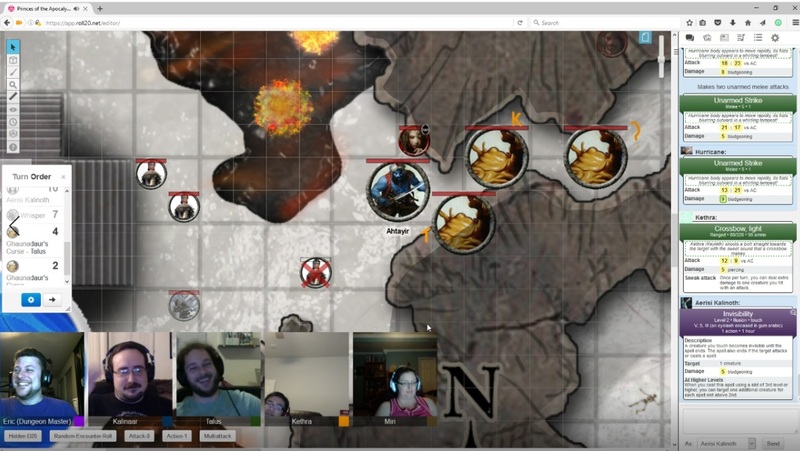 Kethra was able to identify the dark god Ghaunadaur, and Talus detected some magic surrounding the statue, but my players decided to jack with it anyway. Kalinaar began by breaking apart its tentacles as a preemptive caution. Roll for Wisdom saving throw, Kalinaar! Fail? You’re an ooze now! I was ecstatic. 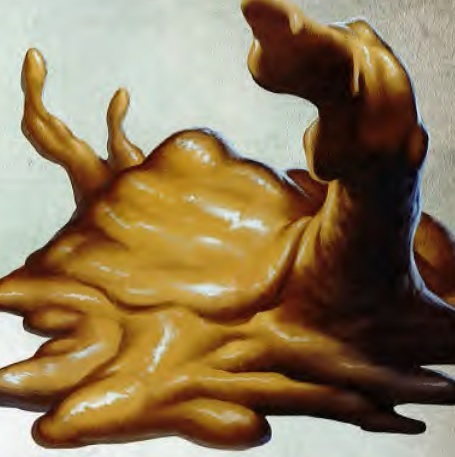 I had written an awesome paragraph describing an Alien-like chest-bursting sequence as Kalinaar’s body explodes into a new Ooze shape (an Ochre Jelly to be exact). The party was horrified and shocked. They figured they had to remove the eye to reverse the curse. Wrong! Talus’ zombie – you’re now an ooze! (rewatching the video, I totally forgot to make the zombie actually roll the WIS throw…oh well). Talus was super pleased about his new pet ooze. I have no idea if Talus would still retain control and how a zombie turning into an ooze would affect its brainless undead status. In the interest of fun I ruled that Talus still had full control of his new Ooze pet. Tim the Ooze! Then came madness. Miri investigated the crystal eye, and found out it wasn’t a crystal at all but just a piece of glass. A glowing purple piece of glass. Talus strangely decided to pick it up. He failed his saving throw, used Inspiration, and failed again. Talus – welcome to Ooze town, population three! Things got silly at this point and we were all laughing hysterically over the absurd situation. Talus had previously rolled a successful Arcana check to determine that they’d need certain higher level spells to remove the curse. Miri tried something else – she tried to bat the crystal away with Lightbringer. Don’t touch the fake-crystal, people! Thankfully Miri was the first one to actually make the save, and she was not ooze’d. The party had no idea what to do here. Talus enjoyed his ooze-form (which is probably appropriate to his inquisitive character) but Kalinaar was less than enthused to be so hampered. The non-ooze women PCs decided they would find help somewhere within the caves. Then they heard the chanting from the West. “Princes of the Apocalypse” includes some interesting If/Then scenarios. The campaign changes and adapts depending on the order in which the PCs tackle the elemental cults. It worked out pretty well that I could put Aerisi in the Fane altar. She was armed with Ahtayir’s horn, and one of the delegates as a captive. I changed out the captive for one far more important for two reasons. First, this captive has a special relationship to one of the PCs. Second I needed someone that had some real information on the main plot and could reveal what’s going on and steer my players into what they need to be doing. As of right now my players are just exploring through these mega-dungeons without much sense of direction. I can use these rescued captives as fonts of information – as I did with the air cult initiates in the Howling Caves. I know my players, and they appreciate having clear-cut directions and goals. What I didn’t plan on was that half the party would be oozes! Miri surprised everyone by striding right up to the cutscene I’d crafted, and unleashing her strongest attack directly at Aerisi. Normally I wouldn’t let such a brazen attack go off without first rolling initative, but I loved this badass action-movie moment so much I essentially gave a her a free surprise round. It was super effective! Aeries failed the STR saving throw, getting knocked back into the flaming oil and dropper her down to half health. Miri was surrounded by half a dozen air cultists but managed to survive like a champ, succeeding saving throws and weaving around using Step on the Wind to grab the horn and summon the djinni. Oddly Kethra decided to hang back and play it conservatively, emerging to plink at the foes with her crossbow and leaving Miri to fend for herself for much of the fight. The oozes were, well oozes with all of 10 feet of movement. Miri survived the round and Ahtayir arrived. Yay goofy djinni voice! 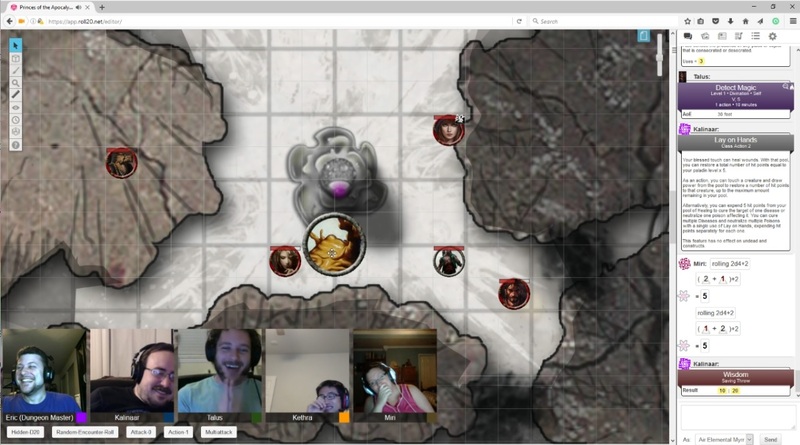 I was pleased that my players remembered him – they’d first met him months ago during their first sojourn into the temples. Miri used her one task to command Ahtayir to de-ooze her friends (minus Tim, Talus preferred the ooze pet). Aerisi still lived, and cast Invisibility to survive another lashing from Miri. In the next round I cast her strongest spell, a level 6 Chain Lightning. Talus had just turned back into his old self, so he attempted to Counterspell, but failed the skill check. Unfortunately for me, the spell targeted the two DEX PCs. Miri made the save and Kethra used Inspiration to roll again and make it. With Evasion they took no damage, and I had rolled a 54! Talus then used Hypnotic Pattern to completely lock down the entire room, forcing Aerisi and her Invisible Stalker to fail using his Divination Die. I was torn on whether to use Whisper. He’s only mentioned in the book if she’s still in the air pyramid, and adding an invisible CR 6 foe makes things much harder. Yet my PCs are also incredibly powerful. I ended up using him as an assurance to balance things a bit back in my favor. Ultimately he didn’t do a whole lot other than getting a few deep scratches on Kethra. I had only one Hurricane left after the massive Hypnotic Pattern went off (everyone on my side failed the saving throw). But I had an ace up my sleeve – the Hurricane’s Gust of Wind could blow all his friends over, snapping them out of their stupor without damaging them. What an excellent use of an otherwise dumb spell. It did allow me to get off one last turn with Aerisi. Miri had snatched Windvane from her incapacitated hands. She ran over to behind Talus, furious at being magically stupefied, and fried him and Kalinaar with a level 4 Lighting Bolt. Talus failed the save and actually went down. Kalinaar took a heavy blow, but on his turn separated the Queen’s head from her shoulders. The rest of the grunts went down quickly, and in the interest of time I had the Invisible Stalker simply retreat, his Queen slain (maybe he’ll come back to harass them at some point…). This was by far one of my favorite battles and combat encounters in the entire campaign. So much craziness happened. Lots of exciting spell attacks. A djinni being summoned. Players Polymorphed as oozes. People being punched and gust’d into flaming oil. And a PC even went down! Finally an epic, memorable boss encounter. We had to end it right then and there due to time, but the PCs earned a ton of XP thanks to the bonus XP milestones I’ve been using. Defeating the Air Prophet is a major story milestone! The PCs have now earned enough XP to reach level 9, and they are in bad need of some rest. They also have a very important person they’ve just rescued. So prepare for a lot of talking and leveling come next session, as the calm after the storm that was Session 38!